Cost? Free but you must place a $30 deposit to assure your attendance at the event. It will be promptly refunded after you attend. If you do not attend, we will be keeping the deposit. 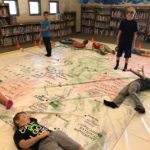 • Experience on-the-map activities that you can do with your school or classroom. • Learn how you can check out the map at low or no cost to you or your school. • Enjoy a fast-paced training session where you become “certified” to check out the map. • Learn what resources are available from the Alliance that will make your teaching of geography much easier. The Arizona Geographic Alliance (AzGA) has wonderful maps and over 330 K-12 lesson plans on its website. In addition we own two copies of a vinyl map of Arizona provided by National Geographic, one of which is located in Oro Valley and available for checkout by southern Arizona teachers. 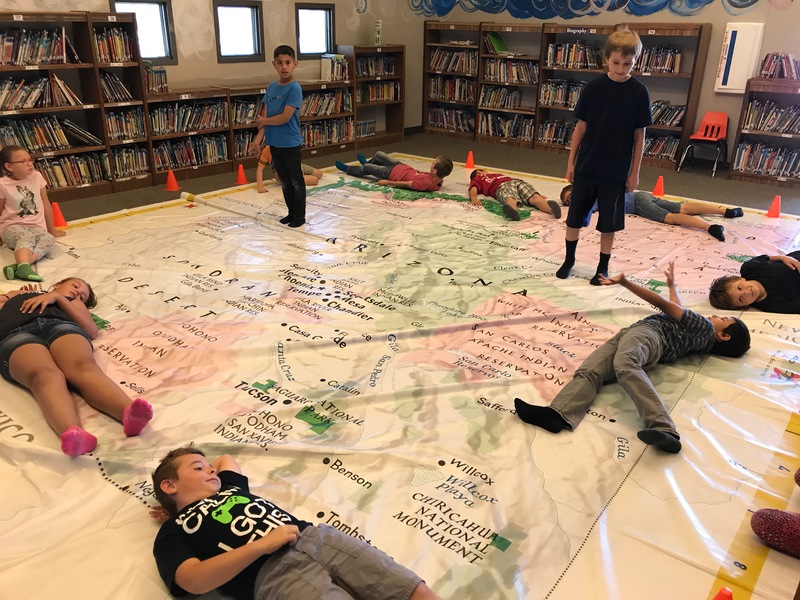 Designed for indoor use, the map is approximately 17 feet by 20 feet and comes with activities and items such as plastic chains, traffic cones, and other manipulatives that can be used on the map. This training to use the map allows you to check out the map for your class or school or community group at no or low cost. The training is free and limited to 45 participants. The training is aimed at teachers or administrators but community group leaders are also welcome. Everyone on the map must wear socks to protect the surface of the map. Deadline to register: 5:00 pm, Wednesday, June 20, 2018. Deadline to request refund of deposit if you do not attend: 5:00 pm, Wednesday, June 20, 2018.